Wed., May 25, 2011, 8:31 a.m.
INVASIVE SPECIES -- Washington officials found invasive zebra mussels on a boat coming into Washington Saturday at the stateline port of entry near the Idaho border. Both Idaho and Washington are ramping up their surveillance for these invasives with horrible consequences to our waterways. Read on for more about this particular case as well as about Idaho's mandatory boat check stations. BOATING -- Mandatory watercraft inspection stations targeting invasive species have opened at five sites in the Idaho Panhandle. 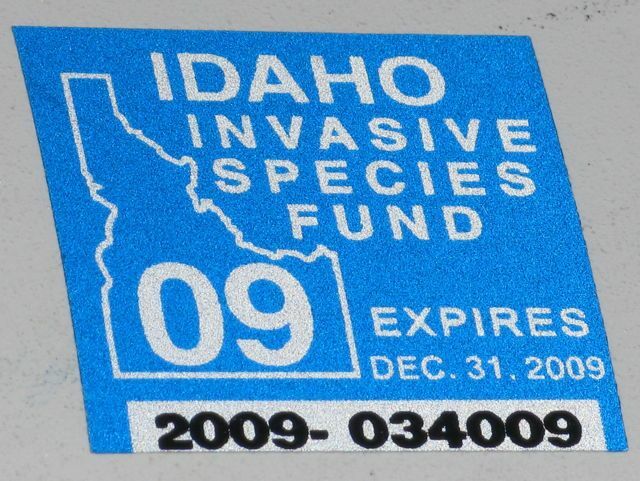 And don't forget Idaho's invasive species sticker requirement for most vessles. The sticker comes with Idaho boat registrations, but a separate sticker must be purchased if your boat is registered out of state or if you have an unregistered non-motorized craft. All non-motorized boats over 10 feet long, including inflatables, are required to have a sticker. Idaho's boat inspection sites will check vessels for standing water and signs of quagga and zebra mussels. Inspectors will ask boaters where their craft has been in the previous 30 days. All boats should be clean, drained and dry when they arrive in Idaho. Cedars, on westbound Interstate 90 at Fourth of July Pass. Huetter Rest Stop, on westbound I-90 between Post Falls and Coeur d’Alene, operating Friday, Saturday and Sunday until May 15 when it will begin opening daily. Garwood, moved this year to Highway 53 (Trent) near the state line, open on same schedule as Huetter station. Old Town on Highway 2 east of Newport. Samuels on Highway 95 north of Sandpoint. These stations will be open 7 a.m.-7 p.m. through Sept. 9. The inspections are an effort to keep invasive mussels out of Idaho’s waters. Zebra and quagga mussels are prolific breeders, attaching themselves to hard surfaces where they clog intake pipes and foul freshwater ecosystems. The mussels have infested the Great Lakes. In recent years, they’ve been found in parts of Nevada, Utah, California, Arizona and Colorado. A 40’ Catalina Sailboat, “Sequel”, that was being hauled from the Great Lakes to a new owner in Vancouver, BC was stopped at the Spokane Port of Entry. During a standard commercial vehicle inspection the alert WSP staff noticed that the vessel was contaminated with zebra mussels and alerted Officers from WDFW, which is standard procedure for a detection of aquatic invasive species on watercraft. Officer Mosman and Officer Spurbeck responded to the location and confirmed the presence of the mussels on the drive shaft, rudder, and the water in-take screens. The mussels were adult sized and intact. Due to the wet weather during the weekend it was determined that the boat posed to great a threat to be allowed to continue across the state in its condition so it was held at the POE until WDFW staff were able to respond to decontaminate the vessel. Sgt. Klein and Mike Wilkinson from WDFW AIS program responded shortly after 0000 Hrs on Sunday May 22nd and contacted the driver that was hauling the vessel. The driver was escorted to the WDFW regional office in Spokane where the boat could be decontaminated while minimizing the possibility of mussels washing into local waterways. At the regional office the vessel was decontaminated using a hot water pressure washer to effectively remove and kill any mussels on the vessel. Samples of the mussels were collected for additional testing. The commercial driver was cited for the unlawful transportation of fish and wildlife for bringing in a prohibited aquatic animal species. The vessel was released at 0230 Hrs and allowed to continue to Canada after the Canadian authorities were contacted and advised of the vessel and how it was decontaminated.